Beautifully cheesy corn puffs - a schoolchild's favourite! Once owned by Golden Wonder (remember those guys?) 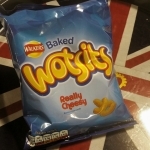 the venerable Wotsits have been at the forefront of British snacks for decades. Grab yourself a pack today!